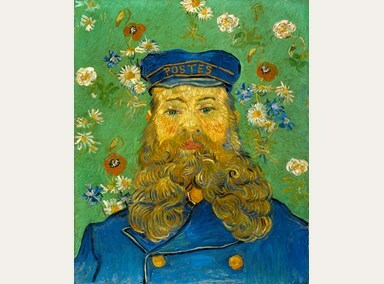 Another gem of a discovery during my recent trip was the Van Gogh Repetitions exhibit at the Phillips Collection, one of my old haunts in D.C. My initial reaction, I admit, was to wonder what kind of hook yet another van Gogh show could have, but the premise to this one really is intriguing. 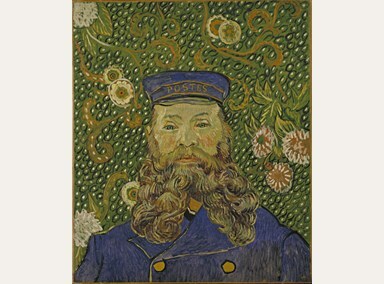 Surprisingly, Repetitions is the first-ever exhibit devoted to van Gogh alone in the history of the Phillips, whose permanent collection boasts some very fine examples of his work. Its focus is not the usual one of the artist’s evolution over a span, punctuated by those highly dramatic episodes of his last years that are central to the van Gogh mythology. Repetitions instead invites the viewer to ponder the artist’s recurrent interest in certain subjects, setting multiple versions of a composition side by side for close comparison and contrast. 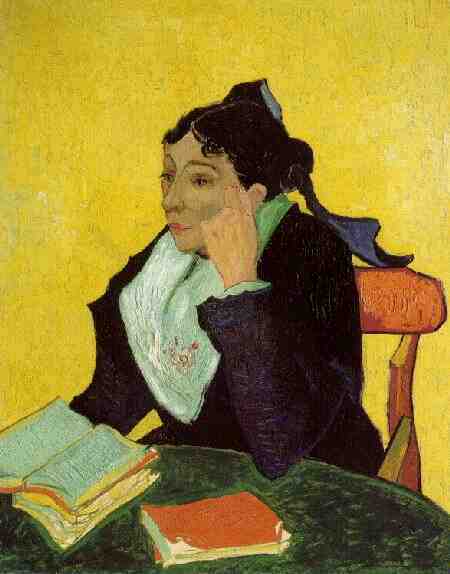 Van Gogh, we are told, himself used the term “repetitions” to describe his habit of returning to subjects such as Joseph Roulin (the famous “postman” of Arles) and the rest of his family, or Madame Ginoux (aka “L’Arlésienne”). I would have liked a few of the missing pieces for fuller comparison (only three of his six versions of the Postman are actually gathered here). Still, the exhibit in general is attractively sized, with a total of just 35 portraits and landscapes — paintings and works on paper — and thus all the more conducive to intimate close-up viewing and “repetitions” of the viewer’s gaze. 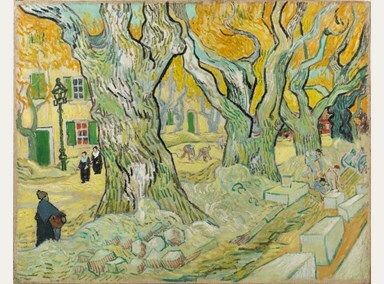 The differences trigger a cascade of questions about van Gogh’s process, technique, aesthetic criteria, and inspiration in general. It’s fascinating, for instance, to see his presentation of his friend Roulin morph between “Northern” naturalism and more abstract, post-Impressionist patterns – or even to compare the echoing decorations he devises for the background. 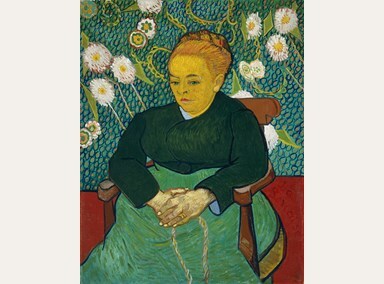 By juxtaposing examples of spontaneity – as in the version of Madame Ginoux the painter said he “knocked off” in just an hour — against a more painstakingly calculated return to the same subject, Repetitions encourages the viewer to set aside the cliches still clinging to van Gogh’s public image (above all of the mad, self-mutilating genius). Since I’ve been listening obsessively of late to the Goldberg Variations (for an upcoming piece on Jeremy Denk’s recent recording), I was drawn to the analogies with what composers do in mutating themes or similar motivic material – how changes in tempo, harmonic emphasis and color, or rhythmic articulation can reveal an unsuspected dimension to what we’ve encountered in another form. It’s perhaps nitpicky, but that’s exactly what these (re)visions of the same subject offer – not literal repetitions. Van Gogh himself likened his process to varying musical interpretations of a score. The curator’s notes also draw attention to the musical qualities he associated with his theory of “color harmonies” – as in the changes introduced to the flowers in the background of La Berceuse (Madame Roulin rocking an invisible cradle), of which he produced five versions.